oh goodness. this is a little apron. specifically, a half apron in white. nothing about it is all that practical except I’m dancing in the kitchen wearing this one, it’s the ultimate in selfish sewing. 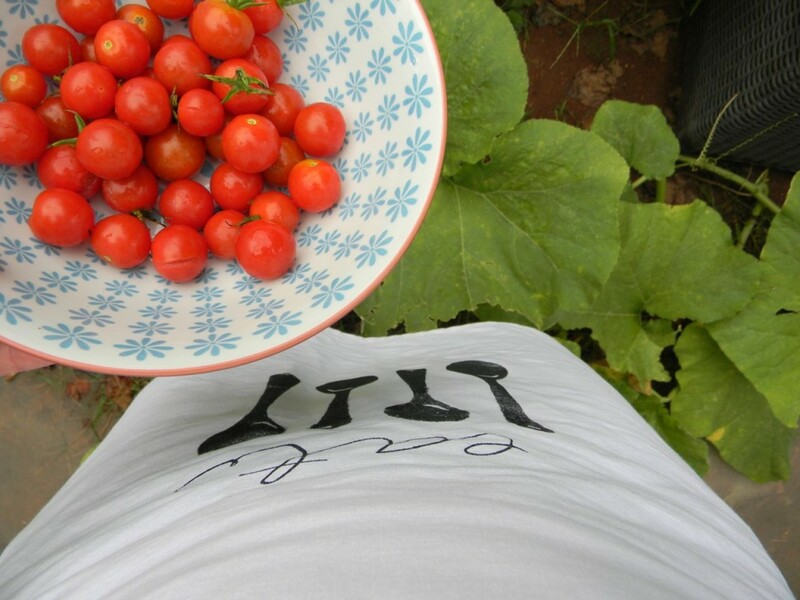 doesn’t it look so pretty next to our abundant cherry tomatoes from the garden? the reason this apron gives me excited bubbles in my stomach is because I did the screen printing on it! yup. designed those little spoons and wrote the word and transferred it to the most amazing photo emulsion sheet, PhotoEZ. I read about this screen printing technique a while back in the amazing book Bend the Rules with Fabric by Amy Karol but I kind of forgot about it. I’m so glad I started re-reading it after my resurgent interest in hand-printing. PhotoEZ is an amazing thing. so much easier to use than regular screen printing photo emulsion process, which is trickier and easier to mess up. Not that any screen printing is easy but PhotoEZ really simplifies the process. I tried it the conventional way and it was a disaster (there were tears when none of my photo emulsion stayed on the screen). this little apron is for me. the fabric is a sturdy white canvas, I feel like a professional cook wearing it. I made one for me and then I made more. I’ll be bringing half a dozen or so of these with me tomorrow to my town’s Arts in the Park craft fair. 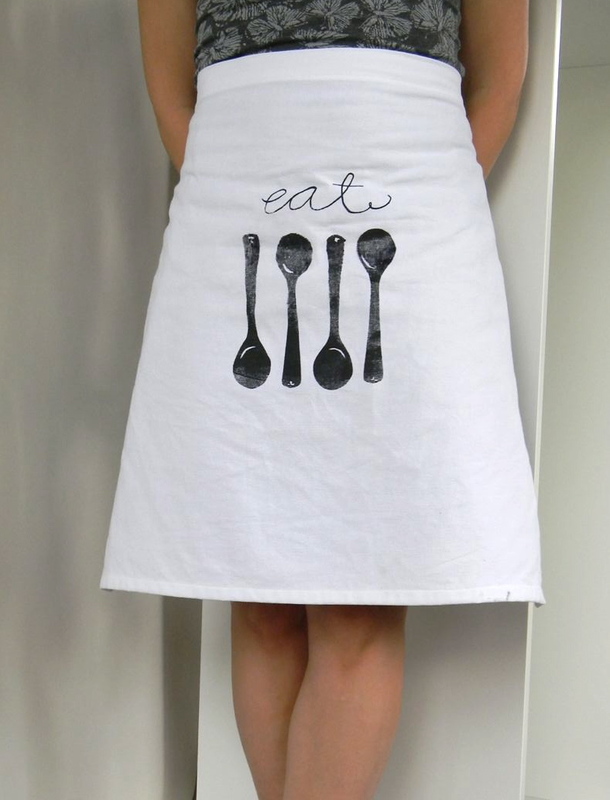 I think paired with a bottle of wine, one of these aprons would be the perfect, indulgent gift for a cook. as I went along, the printing got more and more fun so I made another screen print with a friendly cupcake. 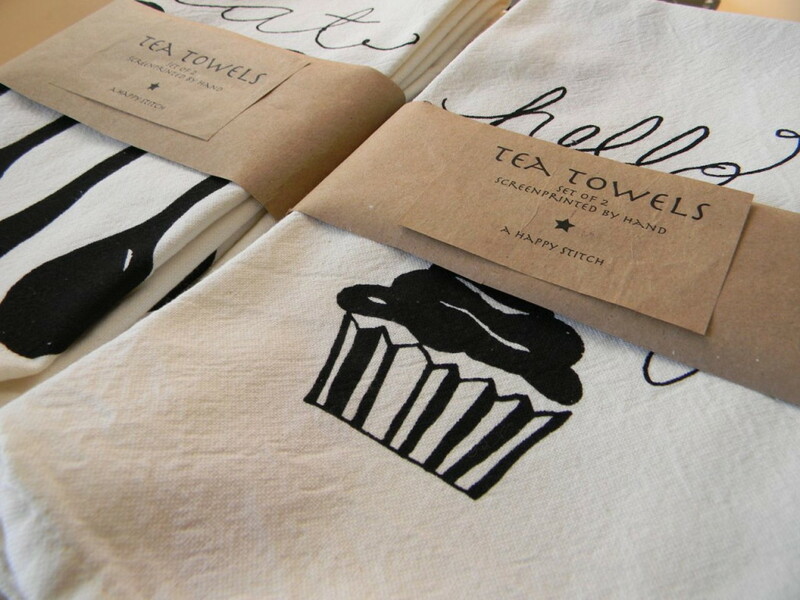 I also screenprinted a few tea towels and wrapped them up nice and pretty. they will be out with everything tomorrow as well. wish me luck tomorrow. and, if you are local please do come and say hi. it’s always difficult for me to decide whether or not to participate in craft fairs. so much time and care goes into making things and often it’s hard to sell them at a price that really reflects all that work. at the same time, it’s a great privilege to be out and a part of a great community event. I think art fairs are good for artists and the visibility of artists and for building a community supportive of that. it just that this isn’t always reflected in the ledger, you know what I mean? thing is all of that support and community building might be more important than what is in the ledger, at the end of the day. this is basically the conversation I have with myself every time I consider entering a craft fair. welcome to my brain functioning. you are very welcome. p.s. I’m so pleased with all the attention this apron is getting! I’m so glad you like it as much as I do, internet. I really hope it inspires you to make your own designs and screen print gifts for others or yourself! That said, these images are my own design and belong to me, please don’t steal them. Thanks. Those are amazing, you will sell out in five minutes! 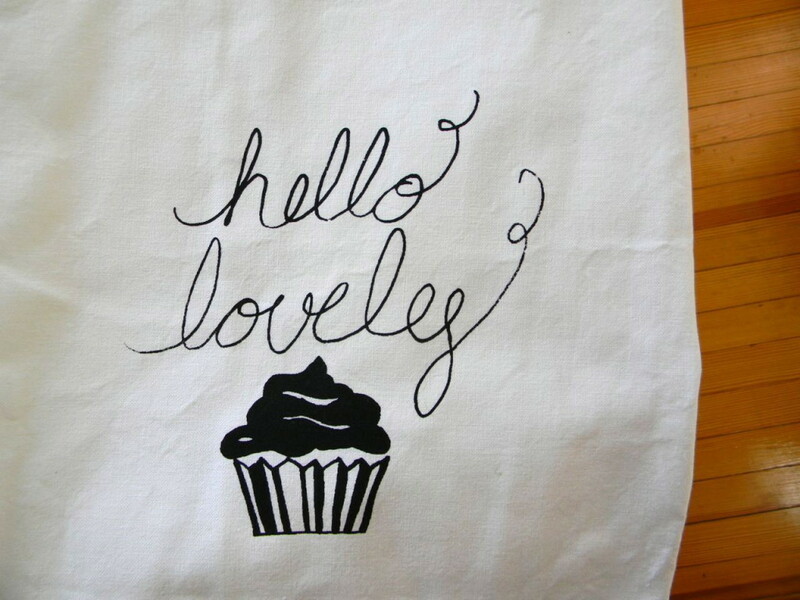 I especially love the dish towels and the hello lovely one! Beautiful! Thank you so much, great to have words of confidence. Screenprinting has definitely become my new favorite thing. Do it! 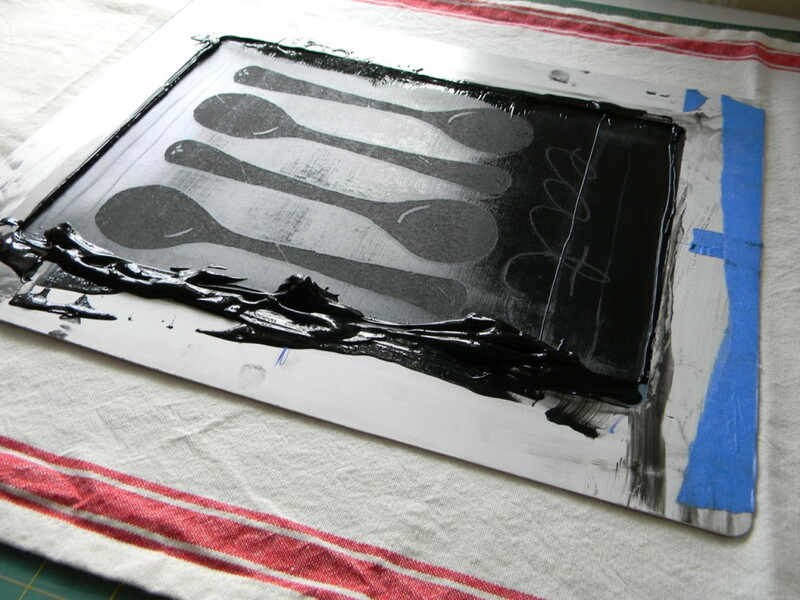 You will love screen-printing. Melissa, these are so fun! I love me 🙂 What kind of fabric did you use for your tea towels? Or did you use pre-made tea towels? I’ve been itching tp print tea towels for awhile now. Also, how does the PhotoEZ work? The website mentions stencils, but is it more of a screen? Melissa, these are so fun! I love them 🙂 I’ve been itching to print tea towels for awhile now. What kind of fabric did you print them on? 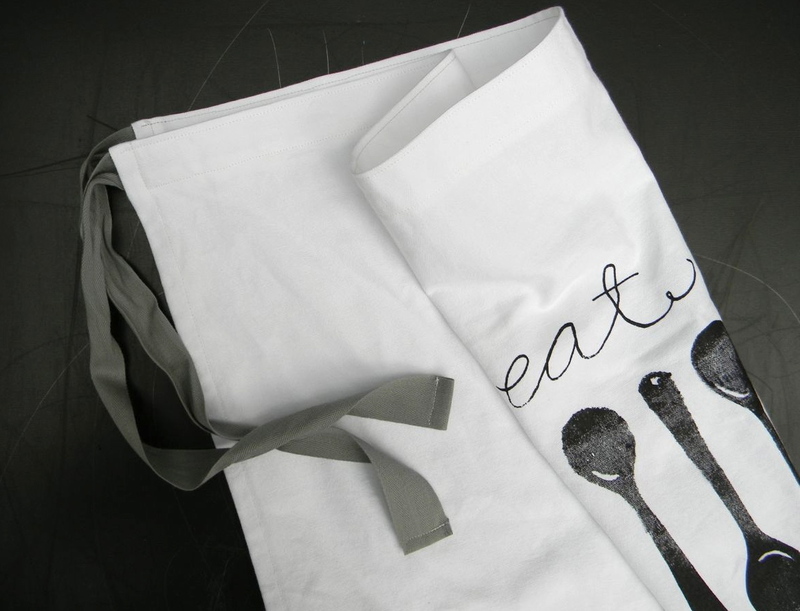 Or did you print on pre-sewn tea towels? Thank you! Such a compliment. PhotoEZ is definitely a screen, with mesh and everything. It already has photo emulsion on it and works super quick in the sun. The language on the website is definitely confusing. I’m not sure why. I used write-on transparencies to make my design and then put it facedown on the PhotoEZ before exposing it to the sun. I did print on pre-sewn tea towels that are 100% cotton. I pre-washed them. Let me know if you have any other questions at all, I’m happy to share more about my experience. Very cute! You did a great job and I hope the sale went well. Thanks for sharing and I love this series!! What a great idea! I I have been looking for a DIY apron idea for so long. thank you so much for sharing!